Alas, let us examine yet another first line today. And at the risk of being too Hemingway-centric, I have been turning this first line over and over in my mind lately. It's typical Hemingway; brief, clean, and concise. As such, it's also (in my mind) very effective. "He lay flat on the brown, pine-needled floor of the forest, his chin on his folded arms, and high overhead the wind blew in the tops of the pine trees." This sentence introduces the reader to Robert Jordan who is lying on the ground surveying a bridge (which he plans to blow up) during the Spanish Civil War. To me, Hemingway is a lot like watching Paul Pierce of the Boston Celtics, by which I mean that Pierce is not especially strong, fast, or explosive. Rather, he appears to be an everyday shmuck. Yet he is extremely effective on the basketball court, and I have yet to figure out why. 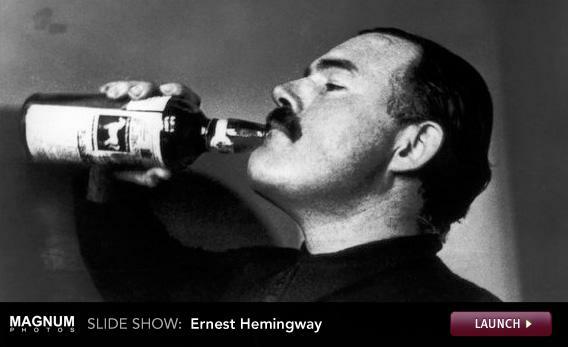 Similarly, Hemingway is not especially verbose, grandiose, intricate, or complicated. His writing is all rather clean. Yet he is extremely effective when it comes to conveying a mood or a feeling, and I have yet to figure out why. The more important question here is how does he drink through the mass of his bottom lip in that picture. Now that's impressive.